In a Wellesley Colonial, an elegant black and white living room. PHYSICIANS WITH FOUR CHILDREN, the owners of this Wellesley Colonial “have a busy household,” says Jessica Dormitzer, a Wellesley-based interior designer. The small living room, however, manages to be removed from the fray — most of the time. 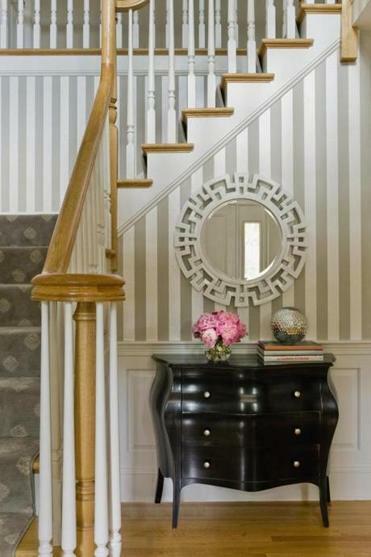 Located off the main foyer, it has a contemporary black, white, and silvery gray scheme, yet feels refined, too, with furnishings selected to complement the traditional moldings and wainscoting. It’s a place where the parents can entertain, but when the children find their way into the room, it’s not a problem. “We made sure everything was kid-friendly,” says Dormitzer. 1 >THE OFF-WHITE SETTEE from Ethan Allen has subtle stripes in the same hue. The upholstery, a cotton blend, is durable. 2 >BLACK DRAPES made of fabric from the textile company Romo feature a pattern with a silver sheen. The painted wood curtain rods are small in scale. “When ceilings are high, I prefer a sleek rod,” says Dormitzer. The wallpaper has white stripes with a pearlescent finish that glimmers when the light catches it. Rose Olson “has a great gradation of texture and color that adds pop to the room,” says Dormitzer. 4 >CHAIRS FROM ETHAN ALLEN are upholstered in one of the manufacturer’s specialty fabrics: a black velvet pattern on a white polyester-blend background. 6 >THE STRIPED WOOL AREA RUG ties the room together while adding textural appeal. 7 >IN THE FOYER, the homeowners’ existing black Avery Bombe chest from Crate & Barrel works perfectly with the new color scheme. 8 >THE WOOL STAIR RUNNER has a regal feel. Bought at Landry & Arcari, it’s punctuated with beige medallions against a gray-green backdrop. 9 >THE COLE & SON WALLPAPER has white stripes with a pearlescent finish that glimmers when the light catches it. 10 >THE GREEK KEY-MOTIF MIRROR came from horchow.com.